Diagnosing a plant with vague symptoms like wilting, yellow and stunting is much like being a “plant detective”. First, you need to profile the “victim” — here, Callibrachoa plugs. Then, collect DNA evidence. Finally, use knowledge and instinct to narrow down your “suspects”. Only then can you come up with a plan to stop the assailant. 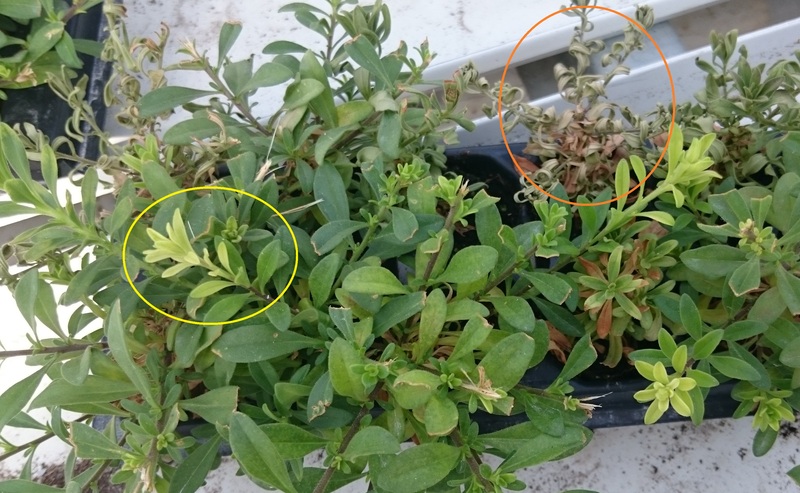 Yellowed plant growth (yellow circle) and dead plugs (orange circle) on a plug tray of Callibrachoa. An unhealthy plug; few white roots are visible. In this case, our DNA evidence (c/o UofG Lab Services) gave me 3 possible suspects: Pythium disotocum, Fusarium oxysporum and Thielaviopsis basicola. But which of these was the real culprit? P. disotocum is rarely documented as an aggressive pathogen in flowers, so we can eliminate that. Similarly, Fusarium is often “around” at low levels without causing a problem. But, T. basicola, better known as Black Root Rot, is a common problem in Callibrachoa, specifically. Rotting roots are not always directly evident (even under a microscope), but severe discoloration of the foliage is a good clue, since this pathogen produces toxins that result in yellowing. Left unchecked, Black Root Rot causes severe stunting and plant death. Luckily, there are treatments for Black Root Rot, and preventative measures that can be taken. A fungus gnat (left) and shorefly (right) caught on a yellow sticky card. Both of these pests can transmit Black Root Rot and other pathogens. Black Root Rot is often transmitted by fungus gnats and shoreflies. Management of these insects is key to prevention. They can be controlled with soil applications of nematodes, predatory mites (e.g. Hypoaspis), or insect growth regulars like Dimilin (diflubenzuron). These products are compatible with biocontrol programs for other pests, like thrips and aphids. A high soil pH encourages the growth of Black Root Rot. pH should be kept below 5.6. 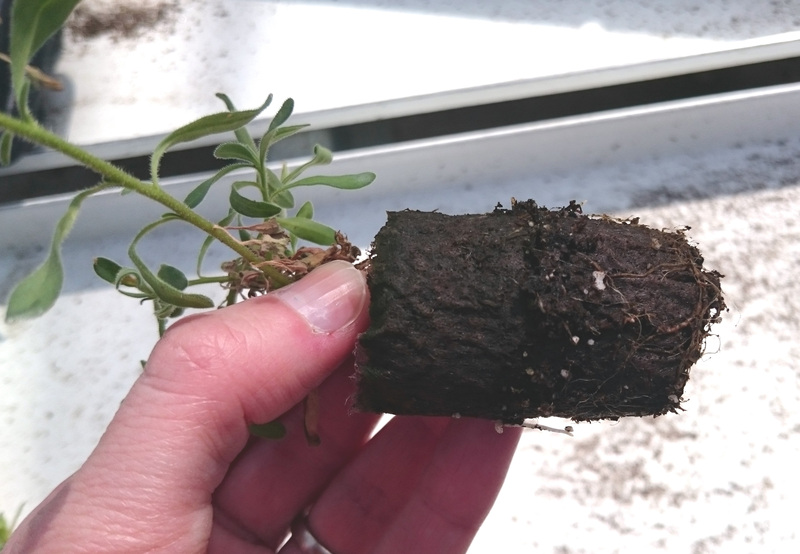 Bio-fungicides containing the beneficial organism Trichoderma harzianum (e.g Rootshield) can help protect plants from this Black Root Rot if applied at planting.